Mohamed Abdelhafiz Ahmed Hussein is facing execution in his home country where he is accused of being a member of the banned movement, the Muslim Brotherhood. State media has reported he was sentenced in absentia to death in July 2017, together with other twenty-seven co-accused on charges of killing a public prosecutor. He reportedly arrived in Istanbul’s main Ataturk airport from Somalia last month, where he was interrogated by Turkish police for not having a valid visa. An alleged photo of Hussein circulated on social media this week, showing he was bound to a seat in a plane and handcuffed behind the back. It was claimed the photo was taken minutes before Hussein was deported back to Egypt. The photo of the young Egyptian man sparked severe criticism from some prominent Islamist figures in Turkey. They castigated the decision, without addressing President Recep Tayyip Erdogan’s government’s support to Muslim Brotherhood as a part of an impassioned campaign. M. Abdulhafîz Hüseyn'in Mısır'a iade edilmesini unutmayacağım. Fakat sırf trollükten kazandıkları paranın hakkını verebilmek için Hüseyn'e iftira atanları ise hiç unutmayacağım. 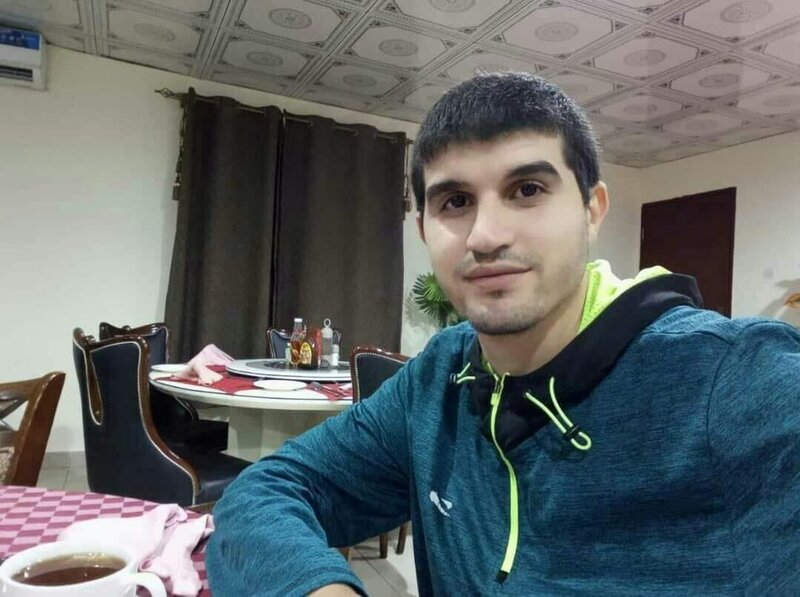 Adem Ozkose, a well-known Islamist once very closed to Turkey’s ruling AK Party posted a photo of Hussein with his 17-month-old son on his Twitter account. 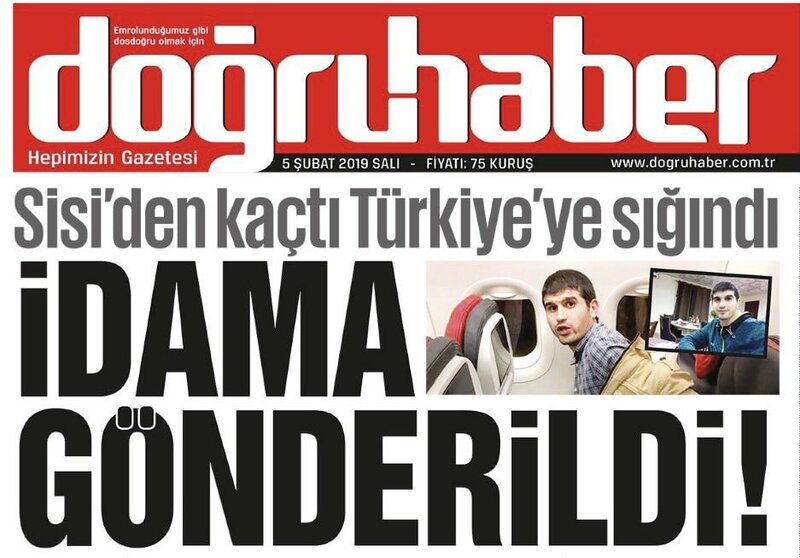 An Islamist daily, Dogruhaber captioned the issue as “a young man who seek refuge Turkey fleeing Sisi was sent back to execution. 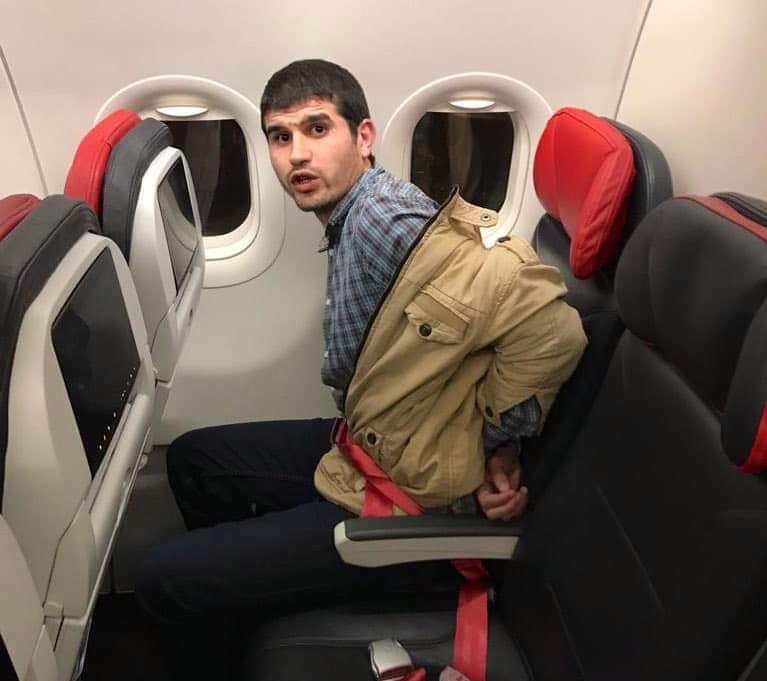 “There was no information he had faced trial, he did not claim protection, officials deemed the Egyptian man an unacceptable passenger,” the Istanbul governor’s office claimed on Tuesday. Eight police officers were suspended from duty and a commission will investigate the deportation, it announced in a separate statement. Hussein was questioned and moved to jail ahead of his retrial after being deported back to Egypt, Reuters quoted security sources. Yasin Aktay, an adviser to Erdogan published an article on Wednesday, arguing it was wrong to repatriate anyone facing charges in Egypt. “During the leadership of (Egyptian President Abdel Fattah) Sisi, Turkey has not and does not hand over anyone facing the death penalty or any other charges,” he wrote. Turkey-Egypt relations sharply deteriorated since the army, led by current President Sisi, ousted elected President Mohamed Mursi, of the Muslim Brotherhood, following a bloody coup in 2013. The Brotherhood has a close relationship with Erdogan’s AKP. Many members of the movement have fled to Turkey since the group which defines itself as peaceful and was deemed a terrorist organization in Egypt. Its alleged followers face persecution. Nearly 106,000 people including 60,000 political prisoners and detainees are incarcerated in Egypt, according to a report by the Arabic Network for Human Rights Information. Human Rights Watch advocacy and communications director, Ahmed Benchemsi, named Egypt as “a full-fledged dictatorship” in January, referring to mass crackdown on dissidents and a virtual ban on protests by the Sisi administration.